170 pages 6” X 9” 4 illustrations by Adriana Manuela. 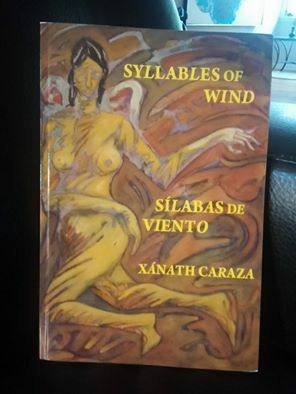 Xánath Caraza’s second full-length collection of verse, Sílabas de viento / Syllables of Wind, establishes her as a premiere author of both Spanish and English verse. Her global reach is always rooted in her Indigenous American heritage. A native of Xalapa and resident of Kansas City, Caraza gives testimony to the powerful transformative experience of global identity. Xánath Caraza teaches at the University of Missouri-Kansas City and presents readings and workshops in Europe, Latin America, and the U.S. Her books Conjuro (Mammoth), poems, and Lo que trae la marea / What the Tide Brings (Mouthfeel), short fiction, have won national and international recognition.